The 1976 Kansas City Royals season was a season in American baseball. It involved the Royals finishing first in the American League West with a record of 90 wins and 72 losses. They lost in the 1976 American League Championship Series to the New York Yankees, three games to two. September 29, 1975: Harmon Killebrew was released by the Royals. November 12, 1975: Nelson Briles was traded by the Royals to the Texas Rangers for Dave Nelson. March 3, 1976: Roger Nelson was signed by the Royals as a free agent. 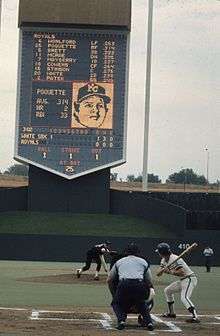 A game at Royals Stadium on Sunday, September 19, 1976. The pitcher is Chris Knapp and the batter is Tom Poquette. The Royals would beat the White Sox 6 to 5. Bill Paschall was drafted by the Royals in the 3rd round. Ken Phelps was drafted by the Royals in the 15th round. This article is issued from Wikipedia - version of the 8/19/2016. The text is available under the Creative Commons Attribution/Share Alike but additional terms may apply for the media files.